Cybex 750T Treadmill Review - Is It the Right One for You? The Cybex 750T is an excellent treadmill. It’s useful for all levels, whether you’re a beginner or a highly experienced runner. I would definitely recommend this for any type of user because it works so well in all functions. Simply put, this is a top quality treadmill with a variety of features. The settings are capable of going both below and above the usual settings, giving features like negative incline which can make workouts super simple for beginners. This type of functionality is what makes the Cybex 750 a treadmill that works for any and all users. Cybex International have been operating for close to half a century, making them one of the oldest fitness equipment manufacturers on the market. You don’t reach this level of longevity without producing consistent quality! They manufacture a variety of equipment including weight racks, multi-gyms and all types of cardio equipment. There are few aggregated independent reviews for this product. Various retailers and marketplaces have rated this treadmill between 4 and 5 stars as well, which is a great score. Comes with an excellent entertainment monitor. This is a dedicated screen for entertainment use. The Cybex 750T treadmill has a 10 x 15 dot matrix display, complete with a 16 character message bar. The display is well positioned, right in front of you and with the buttons located underneath the readout screen. Cybex’s display includes info such as calories burned, pace, time, heart rate and more. This console is minimalist and very easy to use. It’s got six buttons to select your workout and a numeric keypad so you can quickly key in the number you want. Other than this there are also the usual up/down arrows for speed & incline. These are of course well positioned and easy to access while running, so making adjustments on the fly is no problem. There are also alternative arrow buttons located on the support bar which houses the heart rate detectors for convenience. Many treadmills have quite flat displays too which might be awkward to easily view when running. Cybex have kept that in mind and built a much more vertical display so it’s usually in view. 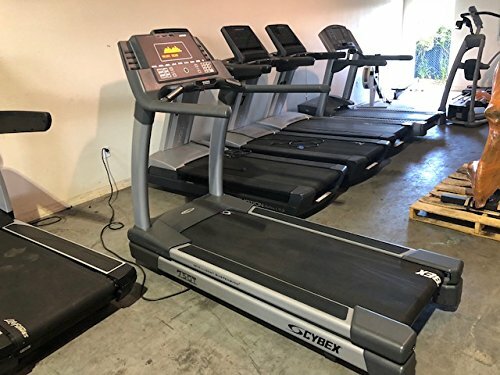 As with other treadmills, this one has two bottle holder areas which can be used for other purposes too, such as a sweat towel or phone compartment. Heart rate monitoring is included too and there is a utility tray which is also useful for storage. For heart monitoring the extra is that you can use a wireless heart rate transmitter instead of the grips if you prefer. An aux socket for audio cables is also fitted and monitor volume is controllable. Speaking of which, the monitor itself is the biggest extra for most users. This is a full color screen monitor which attaches to the user console. It sits vertically atop the console and gives you the ability to listen to music or watch TV with ease while running. There’s also the usual safety clip attachment for emergency shutdowns. Finally there’s also a dual-speed fan fitted within the treadmill. You can choose your preferred setting to create extra cooling and make your run even more comfortable. Between this and the monitor, it’s easy to zone out and make workouts feel like a breeze. Cybex’s 750T comes with a good variety of training programs pre-installed, hitting all the major areas from weight loss to intervals and hill training. Within each program you can also raise/lower the level of that particular workout, so there’s plenty of potential to mix it up and keep developing at the same time. There’s also fitness testing programs so you can see how your overall performance is going, and of course the ability to do a manual workout of your choice. An excellent touch is that this has 9 programmable slots where you can save custom programs. That’s about as versatile as you can get, since now anything is possible! One more benefit to keep in mind is how high the maximum speed and incline both are! Incline goes up to 15% which is considerably more than the basic 10%. It is enough to do most common types of workouts, though of course this isn’t an incline trainer. There’s also the possibility to use a negative incline, giving you downhill angles that can be used as well! The speed setting can also be pushed up nice and high with a cap of 25kph. That’s high enough for many people to reach sprint speed so the variety of programs you can implement is huge. These high settings mean you have even more program creating variety than usual. They also mean you won’t outgrow this treadmill too soon and can consider it a long-term purchase. The likelihood of needing more speed or incline than this is low and probably only applies to high level athletes. These users will need highly specialized machines for their individual needs, but for the majority of people the 750T is perfectly fine. The Cybex Intelligent Suspension System is focused on joint protection. The Cybex research team has found that while cushioning is great when landing on a treadmill, it can be a bad thing when pushing off again. On landing the cushion absorbs some shock and reduces wear on your legs. Pushing off from a softer surface isn’t optimal for your body. When you push off there’s a lot of force being pushed through your legs. Having a soft surface which shifts can cause bad alignment and potential injuries. The Cybex system gets around this by having a soft cushioned area for your landing, to reduce impact. The belt then transitions into a firmer, more stable surface. Pushing off that surface is safe and natural, keeping your legs well aligned. The service wheel is an excellent feature. It can be activated when needed and slid back into the treadmill when it isn’t. With the wheel out, the treadmill is easy to roll around in case you need to move it or perform any servicing/checks. Size-wise it’s a nice, compact unit. The design means the console and any other areas fit into the footprint of the overall deck, which doesn’t have much wasted space either. 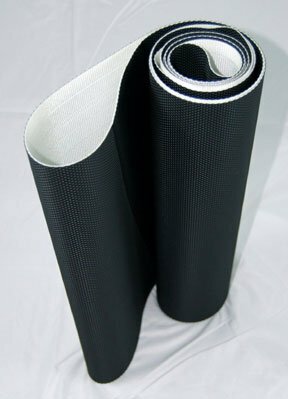 The running belt is a great size and takes up much of the deck area. 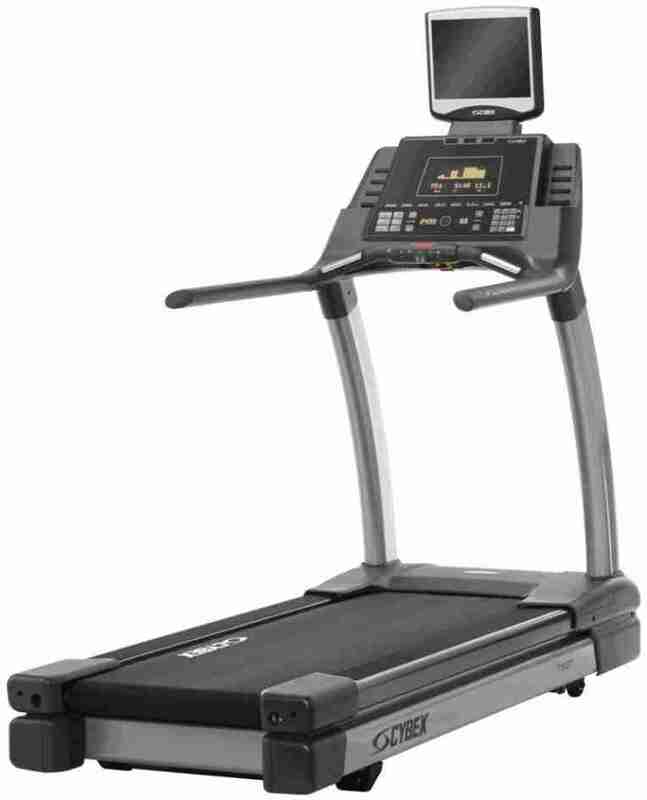 This gives you a large running area while keeping the ground space needed for the overall treadmill lower than average. Simply put, the price probably makes this more appealing to a commercial or advanced home user than it would to the average person or beginner. It’s a considerable investment and there are plenty of cheaper treadmills available. With that said, the number of features the 750T treadmill has is simply incredible. It really stands out in a crowd and is definitely a high-end machine. Cheaper treadmills will struggle to offer everything that this model does. Warranties for items in this range are usually quite extensive. Cybex’s 750T has a frame warranty for 10 years, which isn’t bad though some brands offer lifetime cover. Parts don’t have great cover either, they get 3 years of warranty. Finally there’s a mere 1 year of cover for the deck/belt and labor, which is very low for this kind of price range. It is considered a reliable unit though a mere 1 year of cover for labor means even parts within the 3 year period could end up costing you. That is something I wouldn’t be comfortable with, despite the fitted cooling systems and claims of reliability. Bottom line? This is a great machine. It’s got lots of versatility and customizability. With the custom programming and comfort features such as the fan and the monitor it’s a pleasure to use. On top of that there’s the convenient console & storage areas, plus the unique cushioning system which is a real prize. Almost every user can make great use of the Cybex 750T treadmill to reach their goals. There’s even extras like the service wheel, a belt-cooling system and the wireless heart transmitter. All of this combines as a great treadmill. On the flipside, it’s a big hit in terms of budget. The treadmill itself is expensive, and with limited warranty cover, there are potential ongoing costs to consider. Overall if you can’t afford to buy it and be ready to replace it, then it’s probably not a good idea to pursue. I am using Cybex 750T treadmill. My roller bearing making noice. please follow below link to access the youtube video for the Cyber 750T treadmill.